Poultry farm workers in the USA won their campaign against production line speed up in the factory farming industry which could be coming to the UK via trade deals being negotiated by Liam Fox in secret as part of preparations for the ‘desperate’ trade deal situation after we leave the European Union. The food industry trade union, the UFCW, won their important victory after campaigning against the industry’s attempt to remove the maximum line speed. 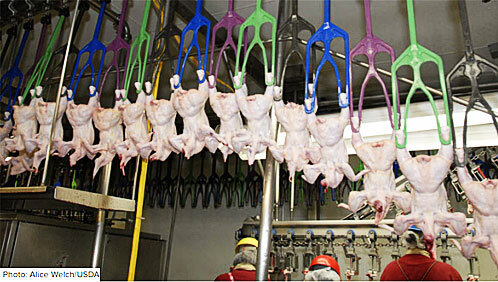 If the petition by the National Chicken Council to the Food Safety and Inspection Service (FSIS) had been successful it would have reversed an Obama administration decision to limit the number of birds processed to 140 per minute. The limit was designed to protect workers from strain injuries and other risks. Marc Perrone, president of the food union UFCW, and Stuart Applebaum, president of its retail affiliate RWDSU, both praised union members who campaigned in support of the line speed limit. Union organisers went door-to-door, made phone calls, and spoke directly with fellow members at worksites, urging them to send postcards and messages to federal agencies. The fight now moves to the pork industry, following a USDA decision earlier in January 2018 to eliminate line speeds in pork processing.